Anyone would dream of owning a rooftop as beautiful as this! I know you will agree with me that having a rooftop would be very pleasing because it is a relaxing space where you can enjoy nature as it sits under the vast blue sky. It could also be a spot where you can get a glimpse of the surroundings and the view which could be the cityscape or the beautiful waters or landscape. Of course, we would add some comfortable furniture on it where we can sit and relax. Others even put a fire feature like a fire pit or a fire place. Plants are also added which could actually bring your rooftop to a different level of comfort and would add more freshness to the space. Yes, a rooftop is something we all want to have in our homes. 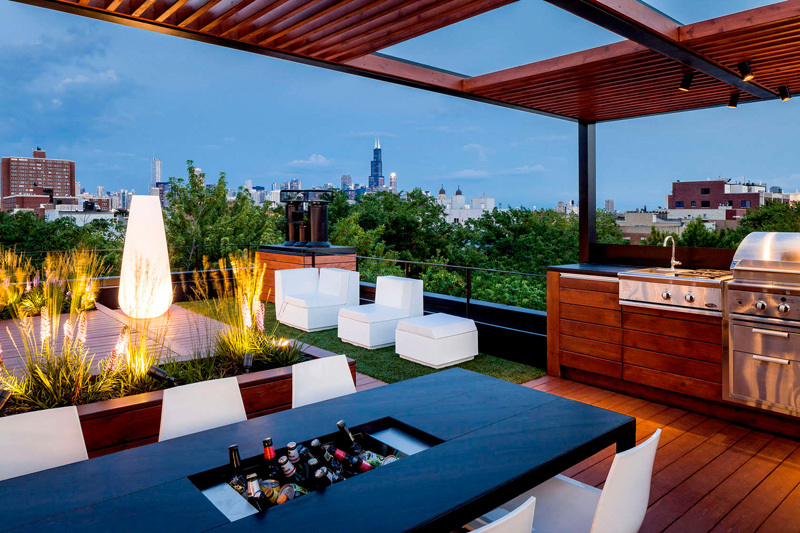 What we are going to show you today is a design of a rooftop that overlooks to the beautiful city of Chicago. 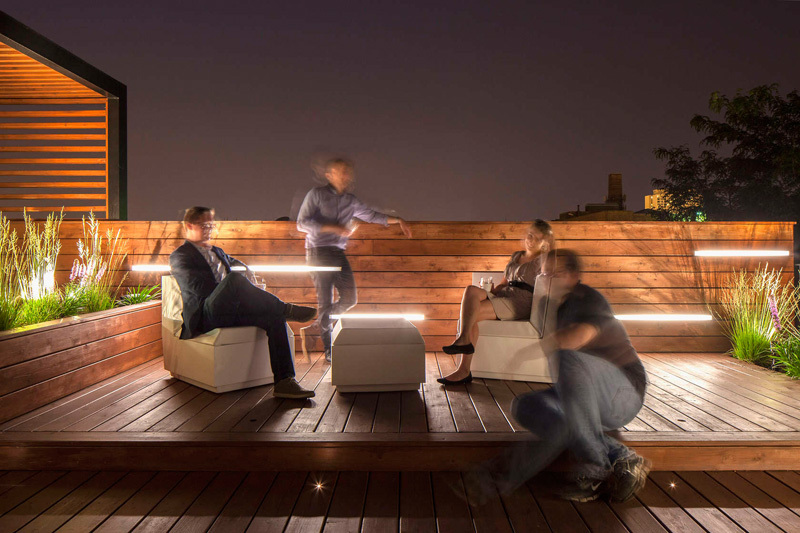 The rooftop retreat was designed to showcase the Chicago skyline and also provide an exciting space for entertaining. It also included a sundeck, kitchen, dining space, game lawn and viewing platform. Six steel beams that tie into exterior masonry walls support the entire deck. With that, the deck is elevated to expand the views of the city and makes the deck seem to float effortlessly above the roof. According to the designer, “a linear boardwalk responds to the narrow footprint of the building, linking programmatic elements and forming an axis which draws one toward the city”. It has an integrated chaise lounge that unfolds from the wood decking to provide sculptural and ergonomic seating. With a roof top design like this, private moments could be spent by a small rock garden and a secluded reading area. You can also see a hammock which could be a relaxing spot too! The sunken spaces of the roof top are carved out of the elevated deck. 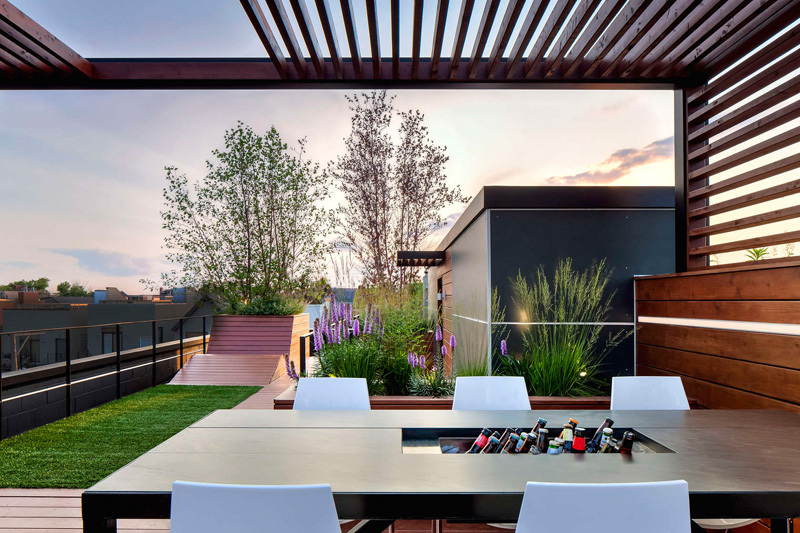 Unique feature: This rooftop features LED wall mounted lighting, integrated chaise lounge, dining area, elevated sun deck, louvered pergola, game lawns and an outer kitchen. Whether you just came from work or you just want to relax and unwind after a stressful day, a rooftop like this would be a perfect place. 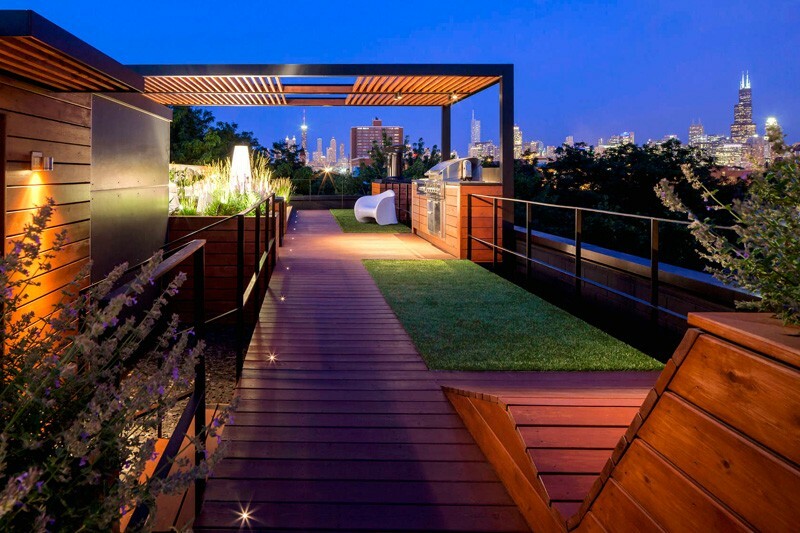 This rooftop used wood for its decking as well as its wall that has a height just enough to provide a view of the city. Aside from the wooden material, the lighting here is a good feature of the roof top too. 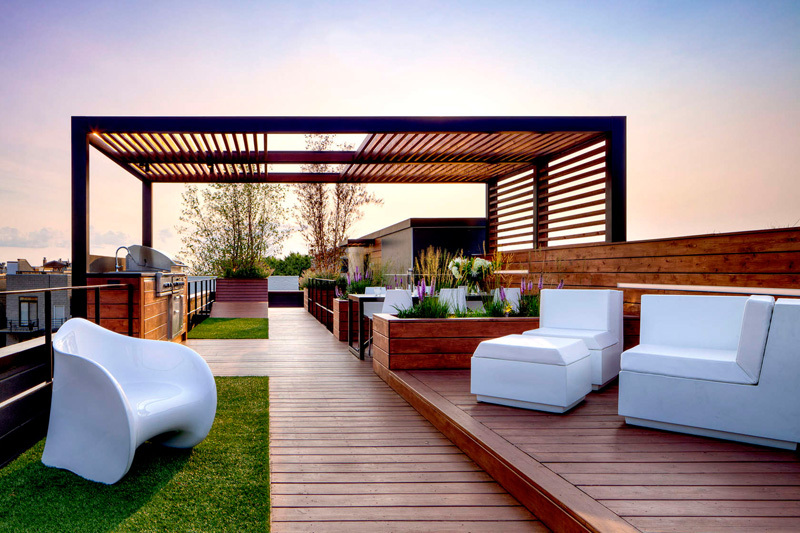 The rooftop has a louvered pergola that frames the city views and a cedar wall provides privacy. I like how they did the layout of the rooftop with artificial grass lawn and plant boxes. The lawn provides lush space for recreation. 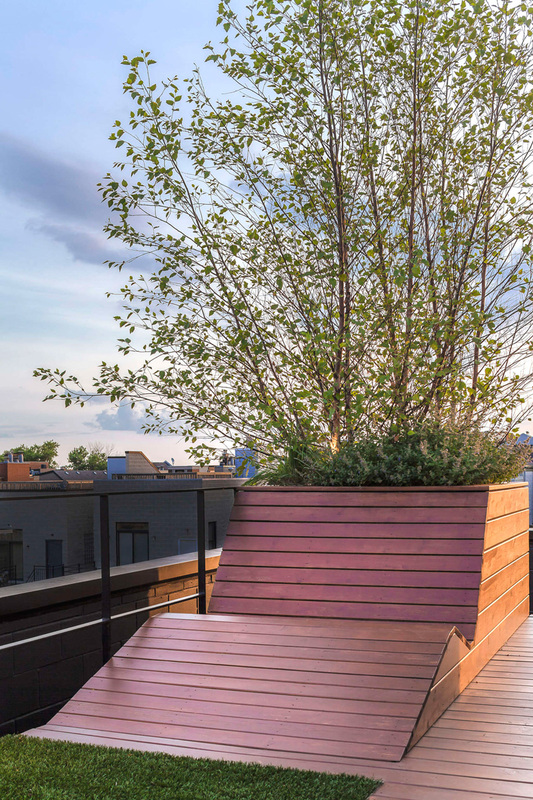 It also contrasts playfully with drought tolerant plants that were selected for their ability to thrive in the urban roof deck microclimate. Aside from the seats scattered on the deck, there is also a dining area with white chairs and a long black dining table- now that sure is a contrast of color! I’d guess that the central part of the dining table isn’t just for storing wine but it could also be converted into a fire pit. Don’t you just love this space? Another impressive feature of the rooftop are the custom LED light bars that are horizontally mounted on the wall for an artful and dynamic evening scene. You can see those lights all over the walls of the rooftop. From the dining area, you there is another seating area. It seems that what defines the spaces are the wooden plant boxes that has pretty purple desert plants on it. Aside from the dining area and the various seating areas, there is also an outdoor kitchen. Of course, that would be necessary. With this, you can prepare fresh food and even have barbecue parties during the night. It would also be easy to wash your hands when you need to because there is a sink on the kitchen area. The kitchen is also clad with wood like the rest of the space. The combination of wood and stainless steel is just perfect! This one is a built-in chaise lounge which unfolds from the wood decking. At first glance, I thought it is for skating. Lol! But it would be weird to skate on wood like this and on a roof deck and on an area as small as this. Oh well. What was I thinking? But this lounge does look interesting and is one feature of the rooftop that anyone would be attracted to. For sure, you’ll be curious of what it is when you first set your eyes on it. To access the rooftop, one need to come out from a cube that has a black and wooden exterior. You can see that a black steel railing separates that cube from the rooftop which is elevated from the flooring. The path that leads to the actual “happy place” is also made of wood charmed by artificial grass lawn. Just look at the lighting! It adds a more dramatic feel to the area. And it doesn’t end there. Look at the view! Oh, gorgeous Chicago indeed! The lights from the skyscrapers as well as the trees will make one feel very relaxed and fulfilled while on the area. Interested to know how the layout of the rooftop looks like? Well, here it is. You can see here that is has an elevated sun deck as well as the area for the hammock with slate chip on the ground. I actually think this is really well-designed! This rooftop is designed by dSPACE Studio who did an amazing job to the area. For sure, anyone who comes to this place would either want to have one of their own or wish that this roof top is theirs! I’d honestly love to see a pool in here. I think that it is the only lacking thing here. A small pool area will do. But it does look comfortable, serene, relaxing and totally functional even without the pool area. But then again, it would be even better if it has one! Lol! I really kept on insisting on the pool. I think you will also agree with me on that. Yet, we are not sure why they didn’t integrate a pool here. There must be some design considerations that weren’t met during the planning process. And that is just a wild guess. Now tell me, what can you say about this roof top? Is this something you want for our home too?